Steven Simon’s sculpture is both a functional series of benches and a text-based intervention on the Great Lawn. Spelling out the word “Place,” Simon’s benches quietly insert themselves into Montalvo’s landscape. Located beneath a grove of trees, the benches serve to stimulate community as young and old gather to sit and relax in the shade or stand, play and clamber on individual letters. PLACE was first created in 2008. Since then it has travelled to diverse venues. Each location and distinct public imbues the work with new meanings and significance. Starting in October 2016, the piece will be located at Saratoga Library, on loan from Montalvo Arts Center to the City of Saratoga for one year. The installation coincides with the City’s 60th anniversary and celebrations of Saratoga as a place. 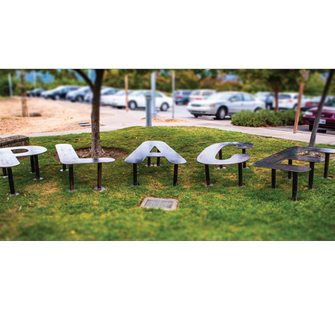 Five steel benches spelling the word PLACE are cut from 1/2-inch thick steel plate. I wanted to physically handle and hold the ideas I’ve been deliberating. Literally touch a term. Hold it, lay down on it - in an actual sense, not just metaphorically. The heaviness of the steel, barely portable, not quite permanent, slightly out of place... In this place, I hope to get people to consider the many contexts and purposes of the word. Place has multiple definitions; Place setting, Place identity, Place transition, Place value, sense of Place.